Do you dream of Vanilla Lattes? Wondering how to make fat bombs that actually taste good? Now you can indulge in the creamy smooth flavor of a vanilla latte in a fat bomb! I'll show you how to make fat bombs with my Vanilla Latte Fat Bomb Recipe. When I set out to make a Vanilla Latte fat bomb, I knew I wanted a smooth, creamy texture and a hint of coffee and cacao. 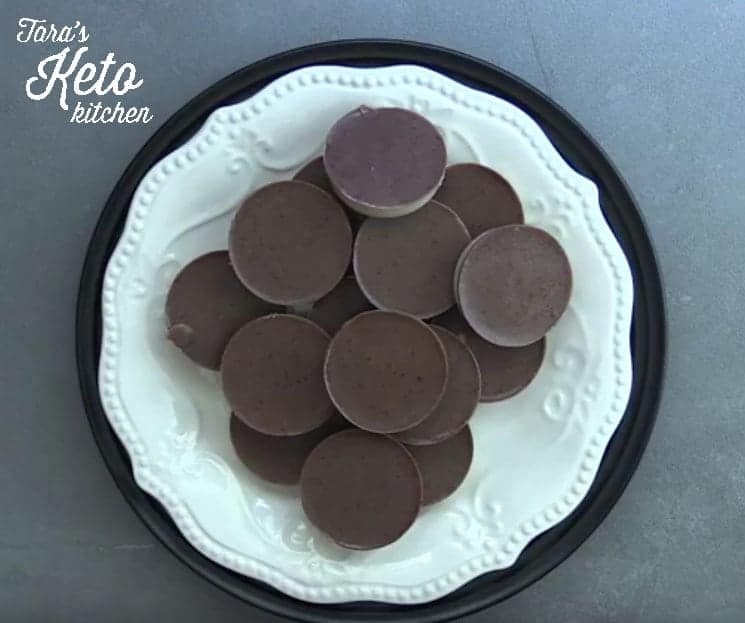 These fat bombs achieve this perfectly with the use of cashew butter. A lot of recipes call just for coconut oil, but my test recipes just left my mouth feeling wrong after eating one. I hope you love this Vanilla Latte Fat Bomb Recipe as much as we do! Preheat your crockpot on high while you get your ingredients together. Turn your crockpot to low and add the base layer ingredients. Fill the mold with a little less than a Tablespoon of the base layer. Then place in the freezer for 20 minutes. In the meantime, make the topping layer by mixing the espresso powder, cacao powder, cream & additional vanilla stevia into the remaining mixture in your crockpot. After 20 minutes, remove the molds with the base layer from the freezer. Top each "fat bomb" with about a half teaspoon of the topping. Use all the remaining "topping"
Place the molds back in the freezer for about 10 minutes or until the topping sets up. Remove the 'fat bombs' from the mold and store in the fridge or freezer in a tightly sealed container. These stay good for weeks stored in the fridge and even longer in the freezer! If you prefer not to use Espresso, then you can omit it and replace it with a teaspoon of cacao. If you prefer a more “milk” chocolate, then use more stevia. You may need to adjust how full you fill your molds if the cup sizes are smaller. Aim to fill them about ¾ of the way full to leave room for the chocolate espresso topping. The most important thing to remember when whipping up these fat bombs is to keep the heat to a minimum. I like to use a mini-crockpot because it helps me control the heat and not get the mixture too hot. What happens if your mixture gets too hot? You can destroy some of the healthy nutrients if you are using raw cacao powder or other raw ingredients. It also makes it very hard to get clean layers if your mixture is too hot. I use liquid stevia in this recipe because it works very well for fat bombs and you don't have to worry about graininess of texture that many of the granulated sugar substitutes result in. You can substitute other alternative sweeteners in this recipe. However, I haven't come up with a great way to dissolve them without heating the coconut oil to a higher temperature. If you do this, just mix the sugar substitute and coconut oil together and heat it. Then allow the mixture to cool to 90 degrees or so before mixing in the remaining ingredients and filling your molds. What ratio should you use to substitute? It really depends on how sweet you want these to be. I have been happy using 1 Tablespoon of Bocha Sweet in these (my favorite granulated sugar substitute). My second choice is Monk Fruit sweetener. I avoid Splenda and Aspartame because of unwanted side effects. Xylitol is another popular alternative sweetener that is ok if you can tolerate it. Some people have GI issues with it.